(NASCAR)—A bad pit stop late in the Southern 500 at Darlington has left Joplin driver Jamie McMurray barely hanging onto his spot in NASCAR’s championship Chase with one race remaining before the sixteen-driver field is set. McMurray had to return to the pits after his last refueling stop and tire change to get a lug nut tightened, dropping him from his top-ten position to eighteenth with laps running out. He rallied back to finish fifteenth but lost valuable points to competitor Ryan Newman, who started last, made it to the lead in the closing stages, then dropped back to eighth. McMurray is only seven points ahead of Newman in competition for the last slot in the Chase field. A victory by either driver next weekend at Richmond would end Chase hopes for the other. The race was won by Martin Truex, Jr., who picked up his second win of the year and joins Columbia’s Carl Edwards on the short list of drivers who have won two of NASCAR’s most prestigious races in the same year—the 600-mile race at Charlotte in May and the Southern 500. Edwards pulled off that feat last year. Edwards ran in contention most of the night until his car was damaged on a restart with less than thirty-five laps left, forcing him well back in the field. He finished nineteenth. The Southern 500 has become NASCAR’s “throwback” race, following the leads of other major sports that recall the past by occasionally wearing old-style uniforms. In NASCAR’s case, cars are painted to resemble notable cars of the past. McMurray’s car recalled Bill Elliott’s 1997 “Mac Tonight” paint scheme for McDonald’s, one of McMurray’s sponsors. Martin has not been back to a NASCAR race until the Charlotte 600 earlier this year. He says he’s happy back in his hometown of Batesville, Arkansas, where he has a car dealership and museum. Martin says he misses the people—drivers, fans, and others—but he says he feels awkward in the garage area when he doesn’t have a role as a driver or somebody working on a car. (IndyCar)—Scott Dixon has moved into some distinguished company with his win at Watkins Glen, his second victory of the year. Dixon, who smashed the course qualifying record, led fifty of the sixty laps to post his fortieth IndyCar win. Only A. J. Foyt and Mario and Michael Andretti have more. Despite his win, Dixon was mathematically eliminated from winning his second straight series championship. 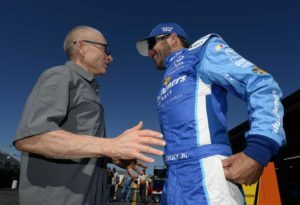 Only points leader Simon Pagenaud and teammate Will Power are still in contention and Pagenaud leads by 43 points heading into the last race of the season next weekend at Sonoma, California, where the finishing points are doubled. Pagenaud was seventh at Watkins Glen but still gained on Power, who crashed and was twentieth. IndyCar doctors will have to decide if Power will race next weekend after examining him for concussion-like symptoms. Power missed the first race of the year after being diagnosed with a concussion. But later tests said he was suffering from an inner ear infection. (Formula 1)—Nico Rosberg has cut the points lead of teammate Lewis Hamilton to two with his victory at Monza in the Italian Grand Prix. Hamilton started on the pole with Rosberg alongside but lost several positions at the start and Rosberg surged into the lead. Hamilton rallied from fifth to the runnerup position but finished well back of Rosberg. The race was run during a weekend of speculation that Formula 1 soon will be sold to an American investor. Two are competing for buying the controlling shares from CVC Capital Partners, which paid two billion dollars ten years ago. The price this time is expected to be about $8.5 billion. Reports say Liberty Media Corporation, run by billionaire John Malone, the owner of the Atlanta Braves, whom some describe as this nation’s largest landowner, faces competition from RSE Ventures, an investment firm run by Stephen Ross, the owner of the Miami Dolphins, and others in a consortium. Making the negotiations even more interesting is Norge, the Norway-based company that is the world’s largest sovereign wealth fund, which is reportedly interested in increasing its share of the stock. What the negotiations mean for long-time F1 Executive Bernie Ecclestone is unclear. He’s 85, has faced some legal problems. Ecclestone and his family trust control fourteen percent of the Formula 1 stock.